Getting kids to eat healthy foods isn’t always the easiest task. Parents employ countless tricks to get their kids the nutrition they need. Whether it’s counting the grapes they have to eat or hour-long stand-offs over a few pieces of broccoli, these tactics are exhausting. Luckily, there’s one piece of fruit parents can confidently turn to – Ambrosia apples. 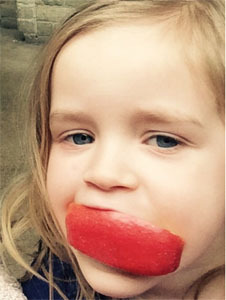 Kids love Ambrosia apples for a variety of reasons. Kids have more active taste buds than adults do because as we age, our taste buds fail to regenerate at the same rate. That’s why kids often shy away from really intense flavours. Many fruits that taste just fine to us are too citrusy, sweet or sour to a child’s young and lively taste buds. Ambrosia apples have a mildly sweet taste that is kept in balance with a slight tanginess. For kids, this is a homerun for their taste buds because no taste receptors are over stimulated. It’s just a nice, balanced bite. The wrong texture can be a real turn off for a lot of kids. When a child’s first apple is a mealy apple, or a softer apple they may associate all apples with having a mouth feel that is neither soft nor crunchy. Ambrosia apples, however are crunchy and have a good snap to them. This makes them fun to bite and chew. It doesn’t take much to turn a child off their food. For example, when kids see dried up carrots or browning apples, they might just turn their noses up (even if they normally eat those foods). The other problem that parents run into is that kids are less likely to eat food that isn’t bite size. Send them to school with a whole apple and you’re likely going to see it come home (or land in the trash). However, if you cut it up and it turns brown before they get a chance to eat it, it’s definitely going into the bin or compost. That’s what makes Ambrosia such a great choice for kids because Ambrosia are naturally slow to brown. You can slice an Ambrosia apple into bite size pieces in the morning, wrap the pieces in plastic or put them in a sealed plastic bag and they’ll still be crispy and creamy white when snack time rolls around. Who doesn’t want to have more fun? Kids love to eat food that’s been cut into fun shapes. The great thing about Ambrosia apples is that you can cut them using whimsical shapes (cookie cutters are great for this) and not worry about them turning brown before they get eaten. And, because Ambrosia are crisper apples, you don’t have to worry about them falling apart if kids decide to play with them a little before popping them in their mouths. Whether you’ve got a picky eater or you’re just trying to find new ways to keep fruit in your child’s changing diet, Ambrosia is a great option. The best part is that they’re not just great for kids – you’ll love them too.